Windows 8.1 is here. It began its roll-out to the Windows Store at 12:00am on October 18 in New Zealand, which is 4am, October 17 Pacific Daylight Time, and 12pm, October 17 in the UK. Windows 8 users should soon see a notification prompting them to upgrade in the Windows Store. Microsoft is hoping that it addresses some of the issues that people have with Windows 8, writing on Blogging Windows: "Windows 8.1 continues the vision we began with Windows 8 and is an example of our commitment to continuous innovation and improvement for our customers." 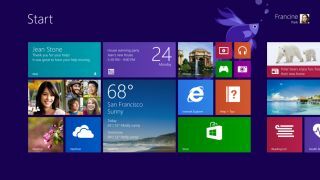 Microsoft first lifted the lid on Windows 8.1 at its Build 2013 conference, and we spent some quality time with it to bring your our Hands on: Windows 8.1 review. The update "blends the desktop and the modern experience," Ballmer said, and includes the return of the Start button (though not the Windows 7-style Start button that some people wanted), a boot-to-desktop option, and more. In our hands on Windows 8.1 review, we found that while the interface tweaks may not appeal to everyone, the performance improvements should do, as Windows 8.1 feels generally snappier, even for simple tasks like compressing files. But why take our word for it when you can download the Windows 8.1 update free for yourself? If you're running Windows 8, simply check the Windows Store where you'll find it as an optional upgrade. Do note that as it's a staged rollout, not every country will see it immediately so if you don't see it, simply check back later. If you're running Windows 7 and you want to upgrade, you won't get it for free. Instead, you'll be able to buy a Windows 8.1 DVD for $119.99 or Windows 8.1 Pro DVD for $199.99 from October 18. Bizarrely, you can't buy a Windows 8.1 DVD to upgrade from Vista or XP. Instead, Microsoft says that if you're running Windows Vista or earlier you'll need to purchase Windows 8, which then qualifies you for the free upgrade to Windows 8.1.